A stunning granite peak in the Paparoa Ranges. The South Face of Mt Euclid has a huge amount of rock climbing potential. Many routes are possible on the 250 metres high vertical face. The rock type is granite, featured with great friction and many quartz veins for holds. Protection is good in general, but most placements require some excavation of vegetation. 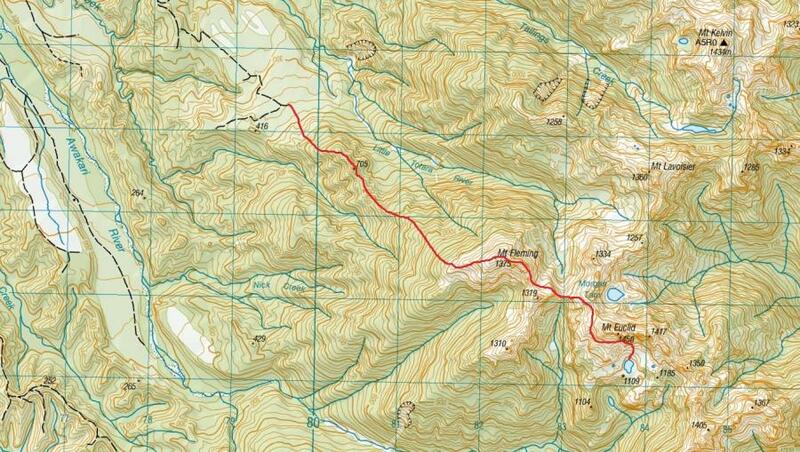 Best approach is via an unmarked track off of a logging skid by the Little Totara River (See topo). Access to base of track is possible with 4wd or take a mountain bike ~10km. The track is roughly flagged up to Mt Fleming then traverse around to the south face of Euclid. Many potential bivvy rocks with small tarns dotted around the basin, or good camping next to the lake. 1) 17, 30m. Start up left slanting groove, left of main central gash in buttress. After 20m traverse to pillar on arete and move around corner to belay on small ledge. 2) 18, 30m. Start up corner, delicately traverse left and up, onto slab up to a belay in corner. 3) 19, 32m. Climb the corner and chimney through a large protruding flake, mantle and continue up corner to a belay out right on ledge left of roofs. 4) 18, 28m. Climb the thin face right of belay, trend left using narrow ledges to access best cracks up face. Exit onto grassy ledge using crack out left. 5) 17, 40m. From grassy ledge climb up the blocky gully to the next grassy ledge. belay up left. Make sure to bring slings for the chock stones 6) 14, 30m. Up a blocky wall to toe of summit ridge. 7) 10, 50m. Scramble up blocky summit ridge to summit of slightly lower peak. A more direct finish could be done up the prominent pillar and open book corner above pitch 5. About 1.5hrs. There is a fairly good track marked with flagging tape.